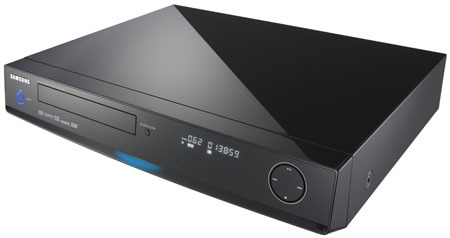 CES 2007 Samsung has announced the second generation of its Blu-ray Disc player, this one designed to convert 1080i content to 1080p, add 7.1-channel audio and to support remote device control across HDMI links. The BD-P1200 contains Samsung's Hollywood-quality Video (HQV) processor which can de-interlace 1080i images into native 1080p, Samsung said - "even from non-Blu-ray formats", it added, so presumably it does a good job upscaling standard-definition DVDs too. "The BD-P1200 supports the 192KHz LPCM, Dolby Digital, Dolby Digital Plus, MPEG 2, DTS and MP3 formats for complete versatility in entertainment," Samsung boasted. It'll even let you change the font and colour of movie sibtitles and on-screen menus. The remote control comes from Samsung's support for the HDMI-CEC spec, which utilises spare bandwith on the link between player and, say, display to transmit instructions. Essentially, it allows users to piont the BD-P1200's remote at the TV and have the commands sent straight to the player. Or allow the player to turn on the television and switch it to the correct input. Samsung's calls its take on HDMI-CEC AnyNet+. The BD-P1200 will ship "early 2007", Samsung said.